From goldfish to formalized best management practices, farmers and ranchers are working together to save resources that the land has provided. Best Management Practices are a set of guidelines that advises producers on how to manage the water, nutrient, and pesticides they are using to reduce agriculture’s impact on the state’s natural resources. As D.R. Fussell and his family operate the cattle ranch, they utilize BMPs, which have long been a way of life at their Ranch in Polk City, established by D.R.’s great-grandfather in the 1870s. One such practice at the ranch involves a rotational grazing system that improves pasture longevity, allows for more timely utilization of forage and increases the stocking rates. 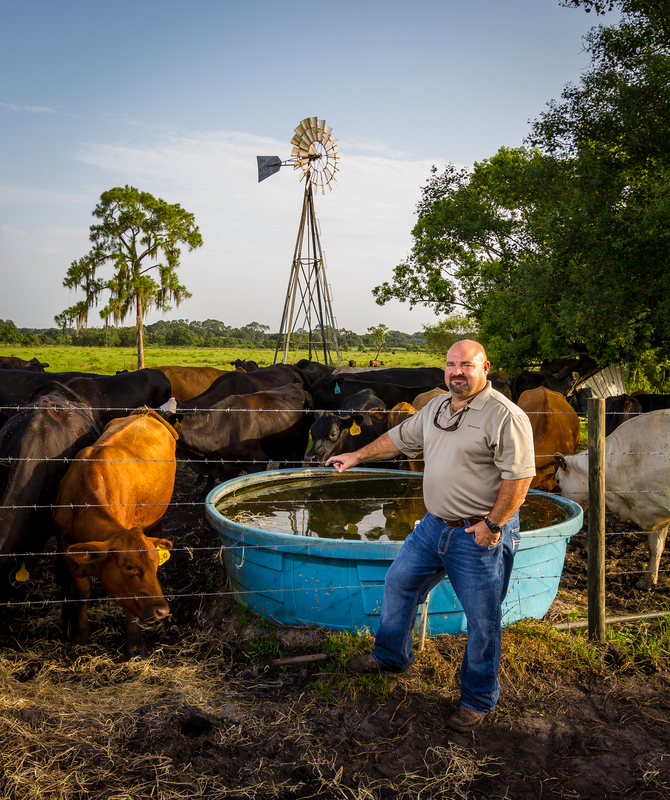 Rancher Fussell has installed wells to give the cattle a reliable source of drinking water and keep them from disturbing the natural wetlands. Soil samples are also taken regularly to ensure the proper amount of fertilizer is being applied to each pasture. Fussell is director of the Polk County Cattlemen’s Association and a past supervisor for the Soil and Water Conservation District in Polk County. Donnie Larsen, of Chance Farms in Winter Haven, is 43 now — but he began to love the life of a cattle rancher as a young lad. “My great-grandfather JD Poole started buying the land and cattle in 1920s,” Larsen says. “He bought and sold cattle and horses. After he passed, my grandparents Faye and Hugh Chance took over the land and cattle. My grandfather Hugh was in the citrus business and my grandmother took care of the cattle. “I remember as a little boy, my great-grandmother, Edith Poole, always had goldfish in the water tank behind her house,” Larsen recalls. “I started helping with the cows as a little boy. I loved it and them. I’d ride in the front seat with my Granny, driving around to check on the cows every time she went- I was her sidekick. As for those goldfish — they do a good job of helping to keep the tanks fairly clean, Larsen explains. “At least once a year we empty and clean our water tanks. Summer heat poses a serious danger for cattle. Their water consumption can be two and a half times greater when the temps are above 90 degrees. Whether ranchers are implementing labeled Best Management Practices or keeping old traditions alive, it is safe to say that Florida ranchers put their best boot forward to keeping the land the same. Using UF/IFAS recommended fertilization rates. Utilizing soil and tissue tests for pH and nutrient analysis. Appropriately storing fertilizer, as well as chemicals. Establishing and maintaining vegetative buffer strips to filter runoff before entering waterbodies. Utilizing cross fencing or fencing of sensitive areas to allow for animal rotation and protection of waterbodies. Properly utilizing waste to be spread on pastures. Managing livestock distribution to reduce any concentrated accumulation of waste that could lead to contaminating ground water or surface waters. Capturing rainwater in stormwater ponds for later use. Utilizing reuse (treated wastewater) water for irrigation. Constructing troughs or tanks for a clean water supply to prevent health hazards. Grazing on established forage heights to maintain plant vigor, prevent soil erosion and maintain soil moisture levels. Incorporating flash grazing in established wetland exclusion areas to manage existing vegetation. Determining the general water requirements for primary forage grasses and improved pastures. Replacing dilapidated water control structures with structures that match original specifications and use good sediment and control measures. Excluding livestock within a 75-foot radius of potable wells. Constructing new wells up-gradient as far as possible from likely pollutant sources, such as petroleum storage tanks, septic tanks, chemical mixing areas and livestock confinement facilities.